Alanna Fox is special assistant to the president of Refugees International. She graduated from American University in May 2017 with a Bachelor’s Degree from the School of International Service with a major in International Studies and a minor from the Justice, Law and Criminology department. Her academic career has focused on human rights and foreign policy with a regional focus on the Middle East. 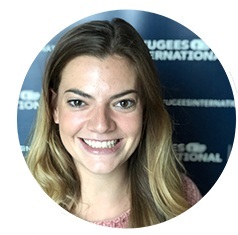 Alanna has also completed two courses at the London School of Economics and was an intern for DCRally4Refugees and for Refugees International before being hired.